Directed by Ridley Scott. Produced by Simon Kinberg, Ridley Scott, Michael Schaefer, Aditya Sood, and Mark Huffam. Written by Drew Goddard. Release date: October 2, 2015. The last few years haven't been kind to director Ridley Scott. With failures like Exodus: Gods and Kings, The Counselor, Robin Hood, Body of Lies, and A Good Year, it's easy to think that he's lost it - that he's no longer capable of creating films as good as those earlier in his career - efforts like Blade Runner, Alien, and Legend. 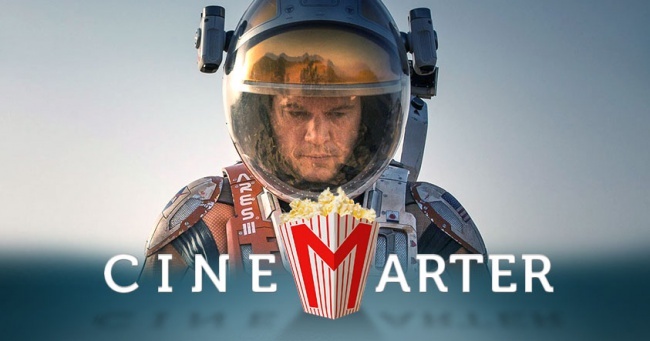 It is with The Martian that Scott turns his critics on their heads and shakes out their lunch money, once again asserting his dominance in the field of cinema. He's still capable of making fantastic movies. 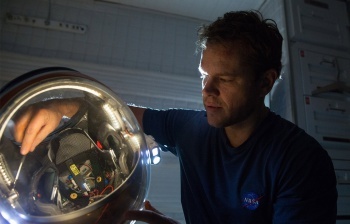 The Martian has a very simple premise that is executed tremendously. During a manned mission to Mars, a storm hits and forces the crew to evacuate in an expedited fashion. One member, Mark Watney (Matt Damon, who can't catch a break in space), is hit by debris and is presumed dead. But, the next day, he wakes up to learn that he is very much alive. But he has no means of escape, no way to communicate with anyone, and will run out of food far sooner than it would take for a new crew to reach him. He is stranded as far from home as literally anyone in the history of the human race has been. That's it. Eventually, communication is established and rescue plans are conjured, although the chances of any of them working are slight at best. For the movie's first half, and perhaps longer than that - I was too engaged to even dare look away to check the time - we simply follow Watney as he tries to solve the problems I mentioned above. While on Earth, we follow NASA director Teddy Sanders (Jeff Daniels) and Mars mission controller Vincent Kapoor (Chiwetel Ejiofor) as they weigh the pros and cons of various potential solutions. Watney's crew isn't told that he's alive. While most movies about or set on Mars tend to focus on elements other than their science fiction, The Martian is dead-set on being a hard sci-fi movie. Outside of a thrilling but more "Hollywood" conclusion, it doesn't focus on action or special effects. It is about a smart man trying to survive on an uninhabited planet, other smart people on Earth attempting to rescue him, and a lot of believable science being thrown in our direction to try to solve various problems that both sides are facing. Perhaps the most amazing thing about The Martian is that it remains both tense and thrilling for the vast majority of its running time, and a large portion of its dialogue involves scientific things that, if heard on the street, the layperson wouldn't have a clue what was being said. But in the context of the film, it all makes sense. Scott, working from a script by Drew Goddard - adapted from a novel by Andy Weir - makes sure that the audience is always engaged in and aware of what's being said. When benefits are being weighed against drawbacks, we feel as if we could chime in and try to influence the characters' decisions. It's science-heavy, but it's not going to alienate the audience because of this.